Fried calamari are a classic second course of Italian cuisine, loved for their crispness. To make fried calamari you have to cut them in rings and then fry them in hot oil. The perfect fried calamari must be dry, golden, crispy but soft inside. Then start cleaning calamari by removing the cartilage pen (1), the skin (2), the fins (do not throw them away), the eyes, the tooth (3) and the innards. Wash all the remaining parts under running fresh water. Now that the calamari have been cleaned (4), cut them forming many rings (5) and let the pieces drain to remove excess water (6). Place the flour in the container (7) and add all the rings and tentacles of the calamari (8). Mix well paying attention to bread all the parts and remove the excess flour (9) helping yourself with a colander. Fry the calamari by dipping them in hot oil – about 170° C – (10) and as soon as the breading becomes a beautiful gold color, remove them from the oil with the help of a perforated kitchen tool or a skimmer (11). Place them on kitchen paper to remove excess oil (12), add a pinch of salt and serve hot. The breading of the calamari, made with durum wheat flour, gives it a classic, simple and tasty crunchiness. The secret for a perfect breading is when the calamari are mixed with the flour: they must be as dry as possible. Experiment in the kitchen and try also other types of flour, such as corn flour or rice flour, suitable for the gluten-free variant. Another tasty way to cook fried calamari is to fry the calamari in a batter made from eggs, flour and water or in a beer tempura. For a light and less caloric version, try baking it by first dipping the calamari rings in a mixture of lemon juice and oil and then – after having drained them – by passing them in the breadcrumbs. Bake for 10 minutes, turning them halfway through cooking, at a recommended temperature of 200° C.
– When serving calamari, cut a fresh lemon into four parts and hand it to guests who might like a few drops on frying. Otherwise try to cut a lot of slices of lemon, flour them and fry them together with the calamari: the result will be fresh and surprising. 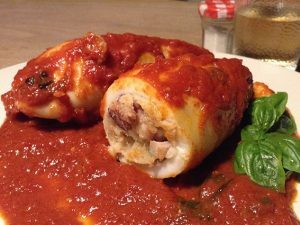 – To cook a plate of fried calamari as tender as in the restaurant, remember to check the temperature of the oil: dip calamari only when it has reached the ideal temperature. – You can also use olive oil but, to get a lighter dish, I recommend using a good seeds oil. 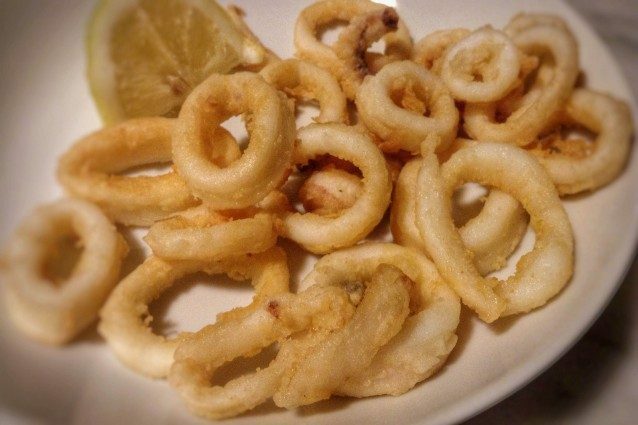 – In order to avoid that calamari are gummy or too hard, cut them into rings not too much big and do not fry them for too long; the breading, in fact, must have a light golden color.